LoA_Facebook reached 200,000 likes! Thanks! 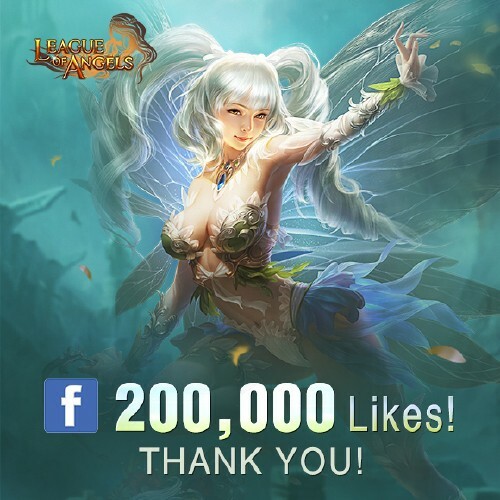 The League of Angel-Facebook has got 200,000 likes! Thanks for your support! Write something nice to LoA and win gift packs. 2.As always, please reply with your server number and in-game name to this post. 2.The rewards will be sent via forum mail after the event is finished. Each entry will receive Arena Emblem x50 and Gold x50000. There are plenty of events in our League of Angel-Facebook everyday, such as Like &Share, Win Rewards, etc. Come and follow us!